- Thank you for sharing! 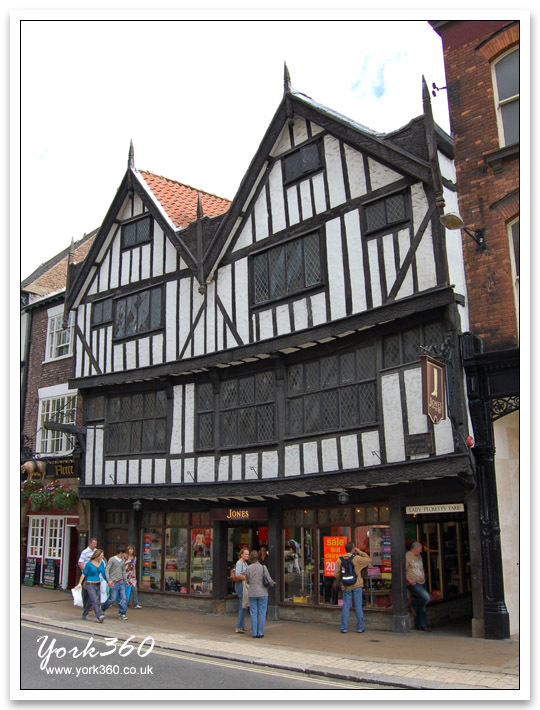 Located in the Coppergate Shopping Centre near to the JORVIK Viking Centre. "We love design, creativity and fun. Follow us and get inspired for home, office and play!" 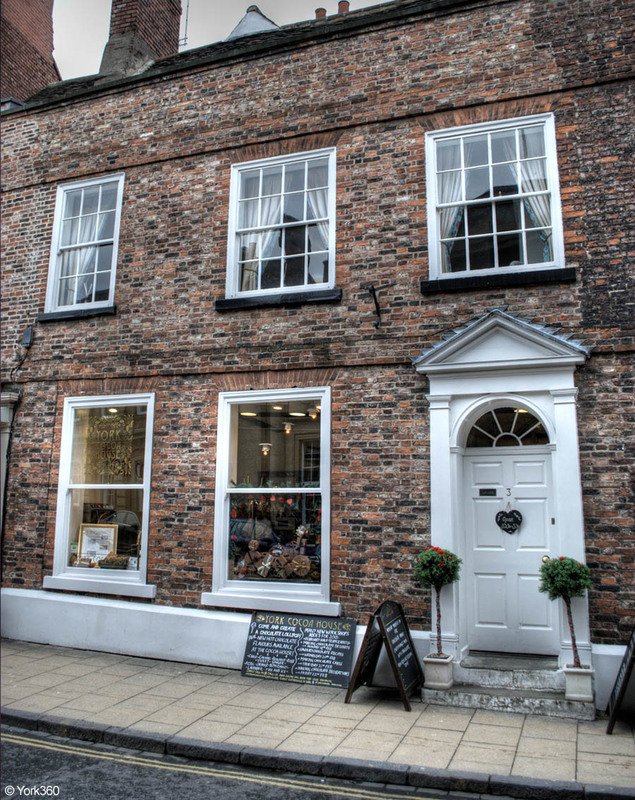 Allenby House, 41 Stonegate. Includes a cafe on the first floor. 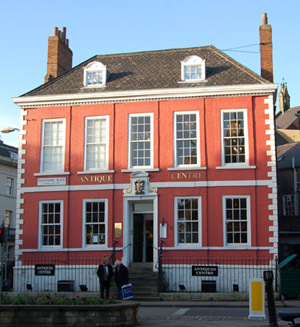 Also in Stonegate - Cavendish Antiques. 6-8 St. Helen's Square, York. 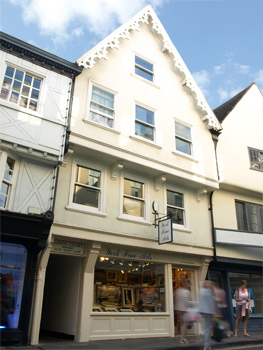 There is also a 'Little Betty's' in Stonegate! 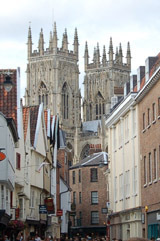 This is a must for any visitor to York! 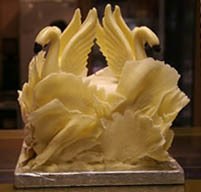 The ornate interior makes for a real treat to have your lunch or coffee and cakes. The long queues outside tell you how popular Betty's is. 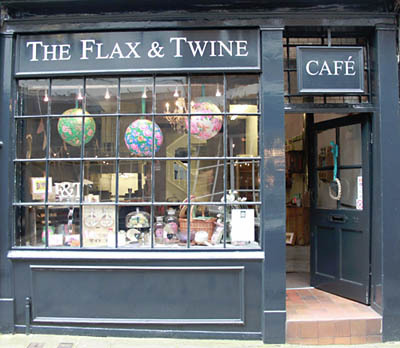 Inside there is also a shop counter where you can buy gifts including specialist cakes and biscuits (try the famous 'Fat Rascal'). You can only find Betty's cafes in Yorkshire! One of the most photographed streets in England! 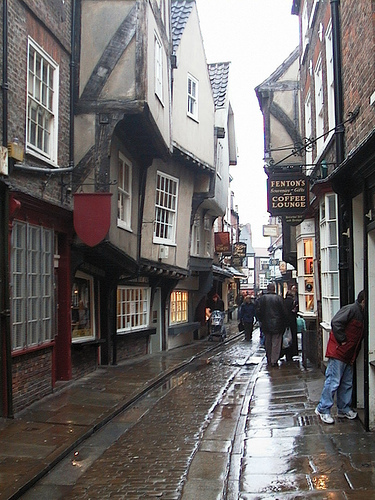 The Shambles is one of York's oldest medieval streets. 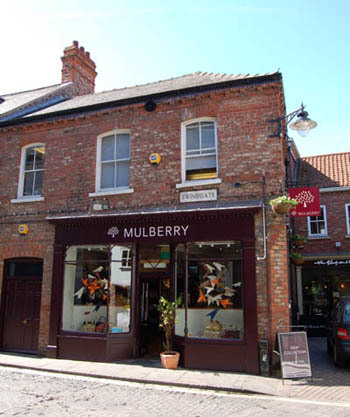 This narrow cobbled street originally housed butchers shops now home to many small curiosity shops. The original wooden beams and slabs in front of the windows can still be seen. The wooden buildings overhang the street so much you could shake hands with your neighbour opposite! At the top end The Shambles opens up into Kings Square where street entertainers wow the crowds. 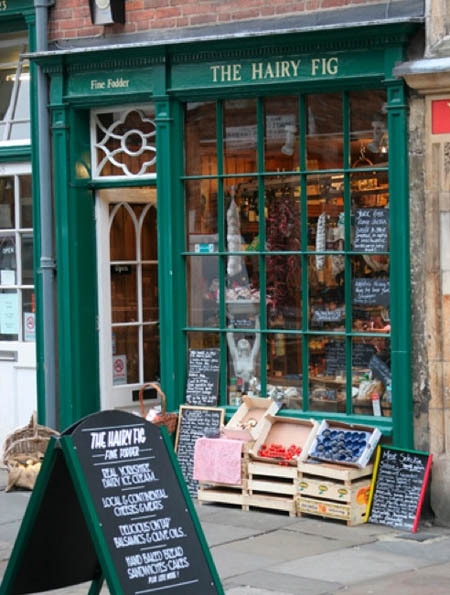 Dave's Hog roast shop near to Kings Square is very popular, where you can get really tasty hot roast sandwiches! Also there is a fish & chip shop on Petergate close to King's Square. 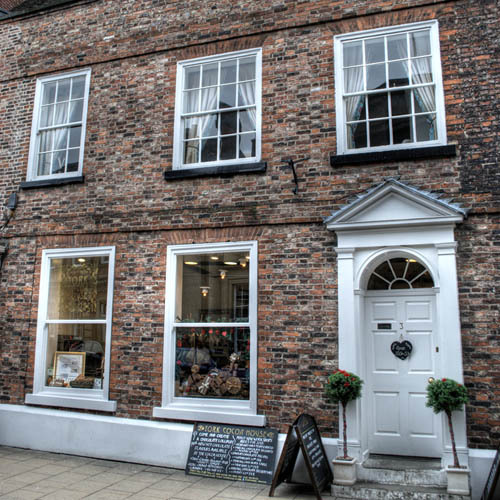 Housed in a beautiful 18th century building at 20 Shambles, York. Selling homewares and unique vintage items to help you make your home gorgeous. 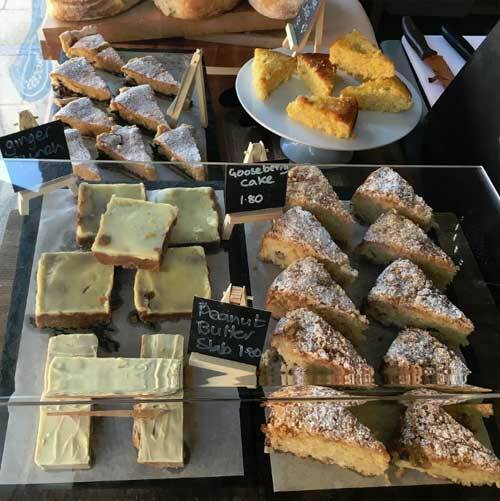 Also a cafe selling lots of tasty treats, including light lunches / afternoon teas, the perfect thing after a day of shopping! We import unique sweets & candy from around the world! Now Closed - Now Five Guys - burger joint. Specialist haberdashery claiming to have the largest stock of buttons in Britain. (www.duttonsforbuttons.co.uk). This building was built in 1422. Fashionable bags, wallets and more. The Quarter is a patchwork of old streets including; Grape Lane, Swinegate, Back Swinegate and Little Stonegate. 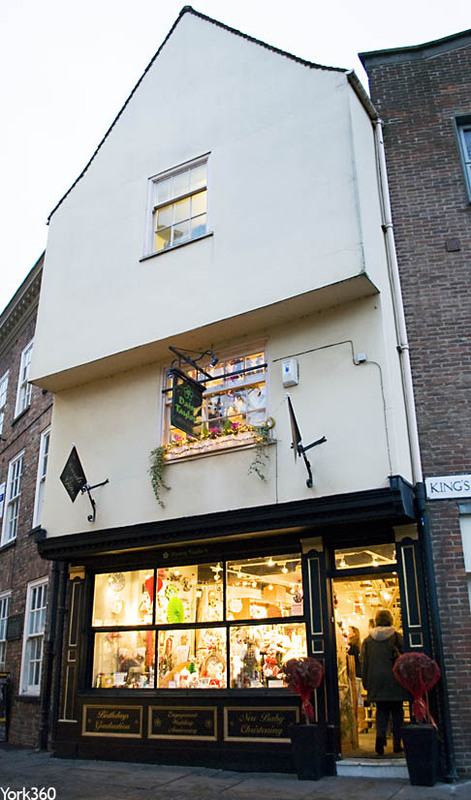 There are many smart boutique shops in The Quarter including: Cusp Children's Toys, Boudoir Kiss Lingerie, Porcupine Gifts, Ashberry of York, Giselle Ladies Fashions. 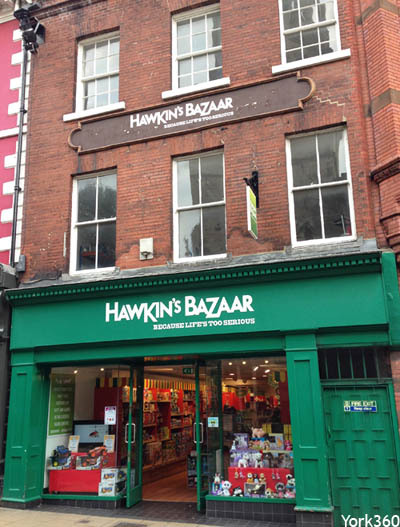 A great model shop for children and adults alike! Now in its 42nd year of business, Monk Bar Model Shop specialises in plastic kits, model railways, diecasts, Corgi and Scalextric. Located underneath Monk Bar. Mary shortle International has been a doll specialist for over twenty three years. As a very serious collector she is passionate about dolls. Running shoes and fitness clothing. '2 floors of things you don't need but really really want'. A huge range of exciting toys, gifts and gadgets. Now Closed. Jones Bootmaker create high-quality, stylish collections of boots and shoes, as well as stocking ranges from brands including Birkenstock, Cheaney, Fitflop and Clarks. 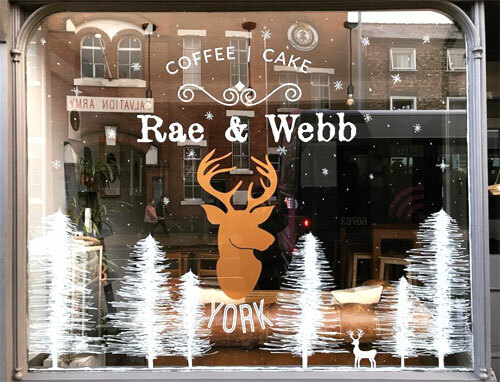 "Rae & Webb coffee shop serves Origin coffee, Joe's tea and a variety of hot and cold drinks, plus a varietyÂ of breakfast, brunches, lunches and a delicious selection of home baked cakes and treats. 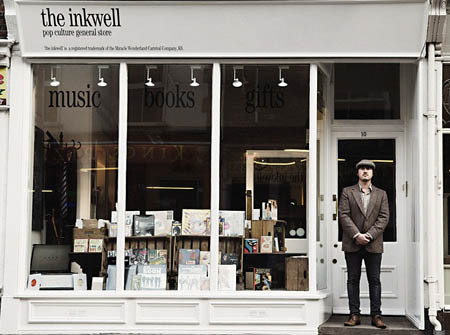 We look forward to welcoming you to Rae & Webb"
The Inkwell is a hip and homely shop specialising in new and vintage vinyl records, CDs, books on history and popular culture, and all sorts of retro gifts. Dressed as a 1950s school room, complete with blackboard and wooden desks. 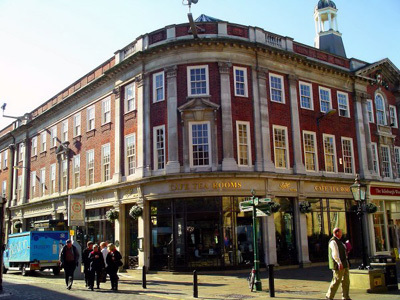 The Inkwell offers York shoppers a unique opportunity to step back in time to a more relaxed and welcoming era of retail. Hot drinks and snacks are available for you to enjoy while you browse and soak up the nostalgic atmosphere. 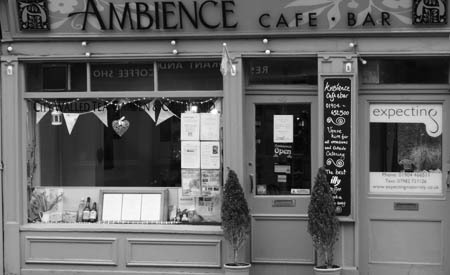 Situated in the slightly bohemian street of Gillygate, with the famous city wall bordering our picturesque tea garden, Ambience is a secret hidden treasure of York. "There's some nice shops down Gillygate!" 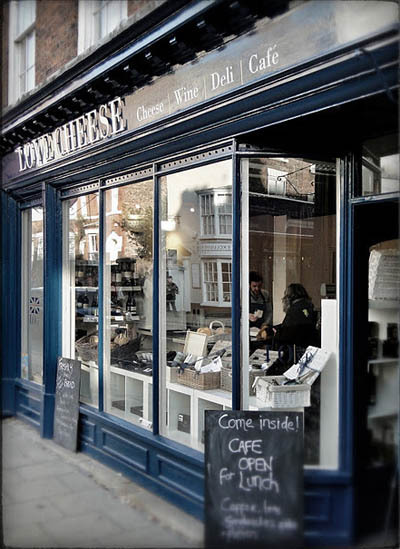 A specialist cheese shop with about 70 different cheeses in stock. 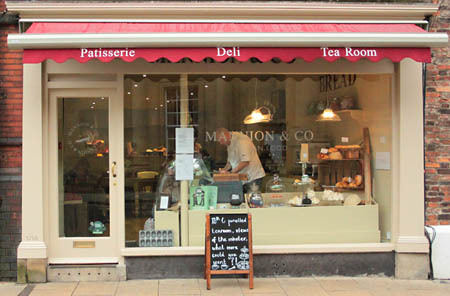 We also have a cafe & garden when you can sit in and dine on a range of platters, salads & sandwiches. 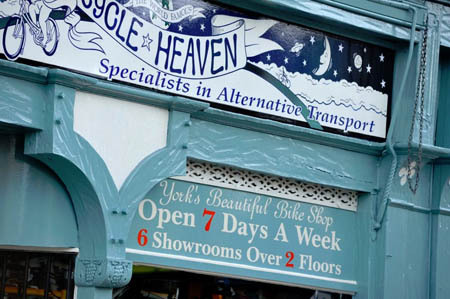 See Indie York's map of independent shops and businesses in York! 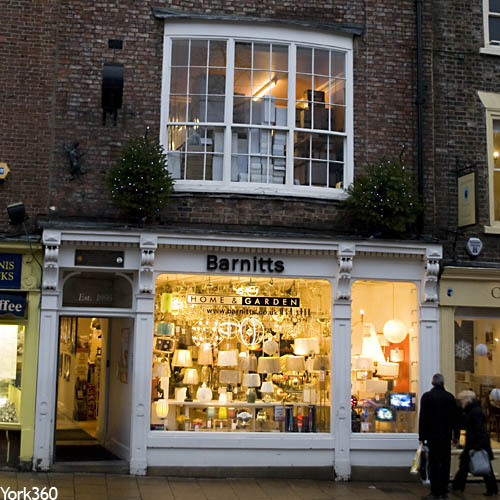 Situated in the heart of York, York Fine Arts has been family owned and operated for 42 years. 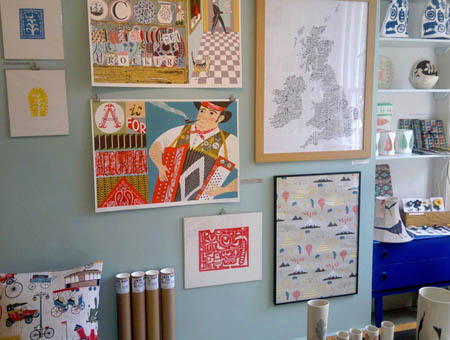 We specialise in traditional and contemporary fine art, and feature over 300 British artists. We also offer custom framing, art restoration and valuation services. 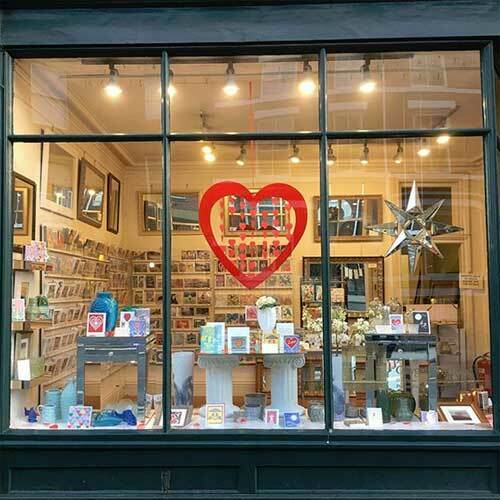 This shop has been on Gillygate for many years and are framing experts, also selling a fantastic large range of arty greetings cards. Selling cards, wedding & engagement gifts. 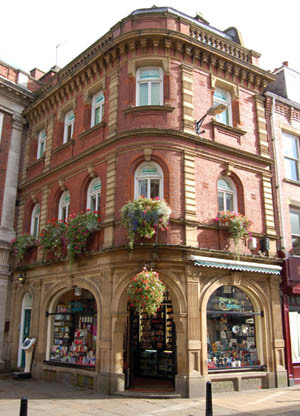 Located in King's Square. 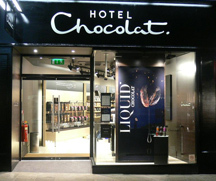 Discover the wonderful world of chocolate in the heart of York, the chocolate city. A chocolate cafe and chocolate making workshops. 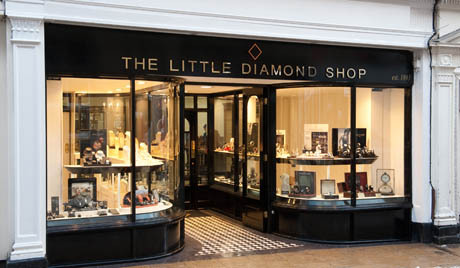 The Little Diamond Shop opened in York on 15 Lendal during Christmas 2010. 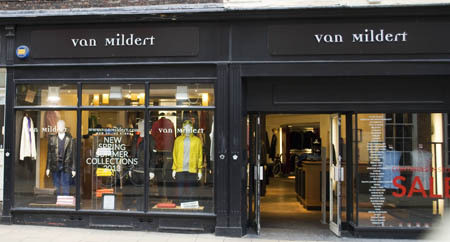 The shop takes its name from the original name given to its sister shop, Ogden of Harrogate, by its founder in 1893. In fact, the clock from the original Little Diamond Shop takes centre stage in the shop as a proud reminder of the company’s history. 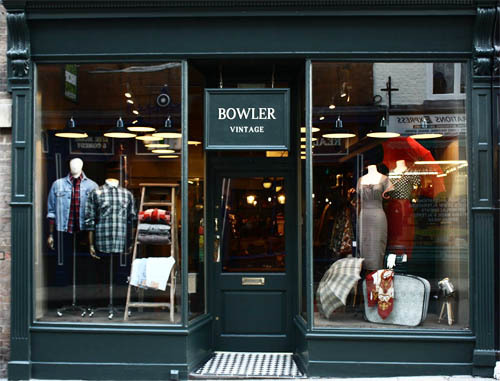 As a sister showroom to Ogden of Harrogate, the shop reflects Ogden’s heritage but gives it a contemporary look too. Traditional elements such as Edwardian display cabinets have been mixed with a bolder decor to give it a more modern feel, while maintaining the sense of luxury associated with the company. The Little Diamond Shop stocks many of the brands and jewellery collections that regular customers to Ogden of Harrogate will recognise and in addition several exclusive collections including Sarah Jordan jewellery and Technomarine, Fortis, Mondaine, Cuervo y Sobrinos, Manometro and Carl F Bucherer watch brands. Many products are exclusive to us in this area including our delicious on-tap balsamics of many varieties, and quality extra virgin oils and rapeseed oils. Whisky, port and fig vodka all on tap. Buy an ornate bottle from us at just cost (or bring your own) and we will fill it. 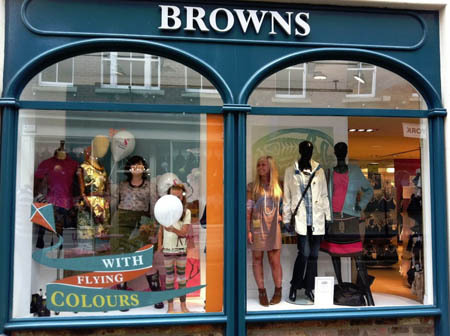 Browns are an independent family owned department store based in York, Helmsley and Beverley. 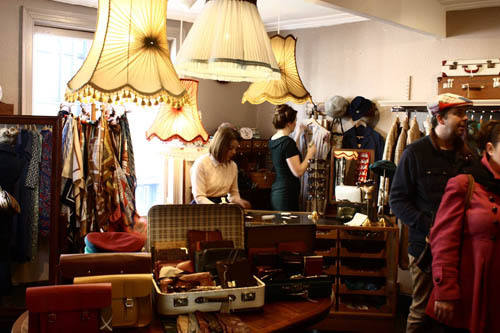 They have been operating for over 100 years and offer a stunning selection of different products under one roof. 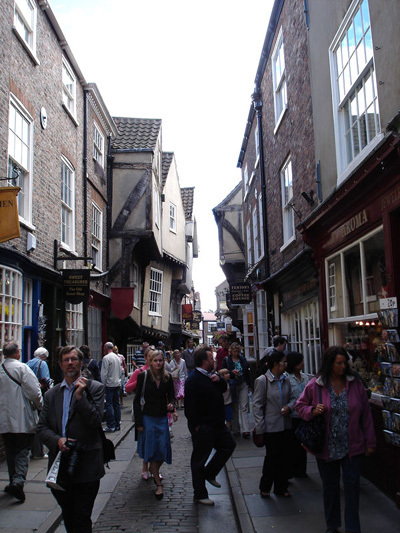 Fewick's is located at the Coppergate Shopping Centre near to the Jorvik Viking Centre. 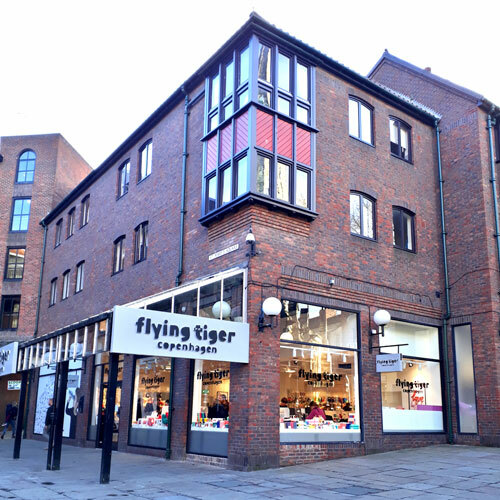 The 1st floor is the place to go for women's clothing and the excellent cafe-restaurant. Exclusive beauty and fragrance brands occupy the ground floor together with menswear, stationery, luggage and accessories. For linens, cookware and toys, head for the basement. 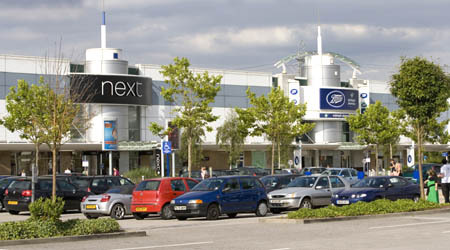 Visit Monks Cross Shopping Park with ease of access and free parking. Home to the regions largest M&S store. 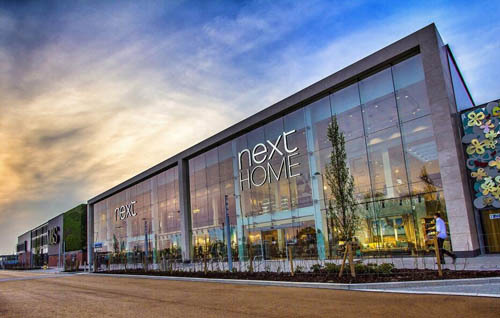 Home to M&S, John Lewis, Next, Giraffe and six new restaurants. Free parking. Located just south of York near the interchange of the A64 and A19, 10 mins drive from the city centre. 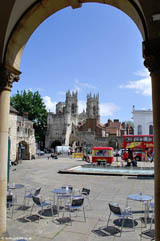 York Designer Outlet runs the Red Line Park & Ride bus, which operates from the railway station every 10 mins. Look out for the branded bus at the front of the station. Kitkat, Yorkie, Quality Street, Smarties, Chocolate Orange, Black Magic, All Gold.. the list goes on, all originating from York. 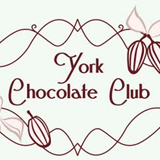 York is famous for its Chocolate, with names like Rowntree's and Terry's now known all over the world. 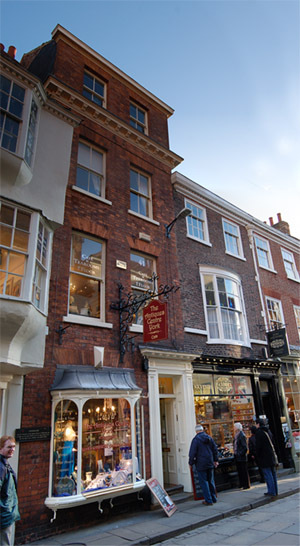 Terry's of York was one of Britain's oldest confectionery makers and was one of the first to make eating chocolate rather than drinking chocolate. Rowntree's still has a huge factory based in York. 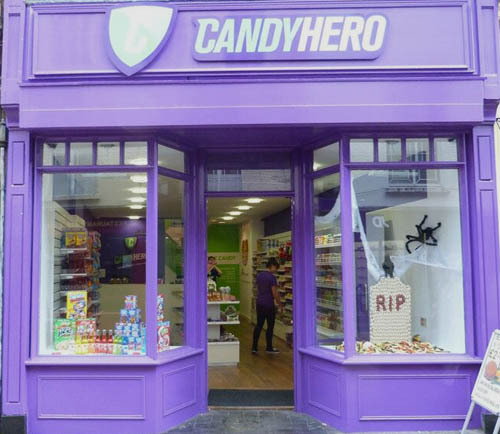 Visit the brand new York store and see a range of authentic, fresh chocolates. 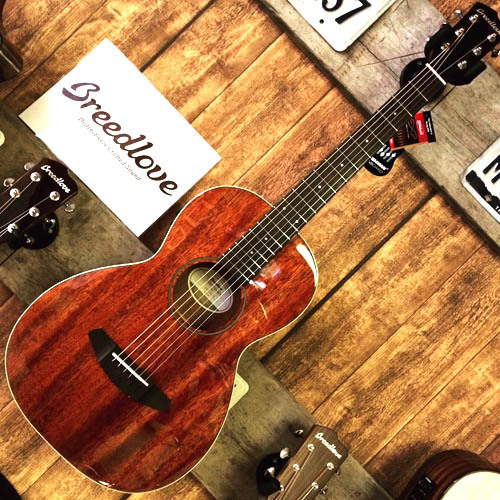 Find the perfect gift, there’s something here for everyone. The Minster Gift Shop inside York Minster & York Minster Gifts situated in Minster Gates opposite the south entrance to the Minster. Selling cards, calendars, prints, jewellery and gifts. 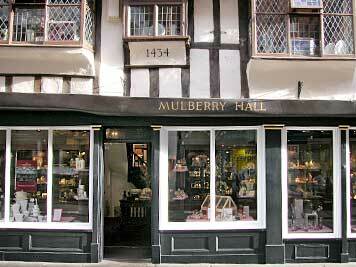 Open from 10am - 5pm Mon-Sat and 11.30am - 5pm on Sundays. 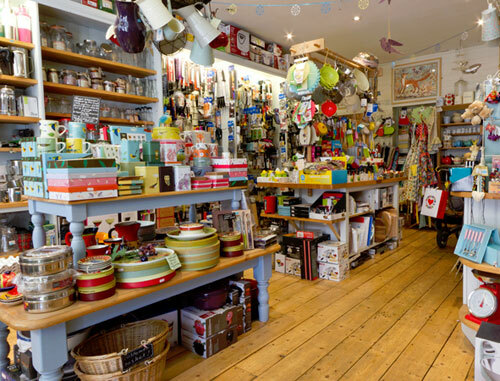 A lovely cookware and gift shop, supplying ovenware, utensils & gadgets, bakeware, sugarcraft, cake tins, gifts, and greetings cards. The shop is easy to spot. Approaching Sutton-on-the-Forest from the south, the farm shop is on the left about half a mile from the village. The shop is located off the main A59, only a short drive from both Harrogate and York.